After writing about the history of Garamond no. 3 I came across a copy of The Linotype Magazine (vol. XVIII, no. 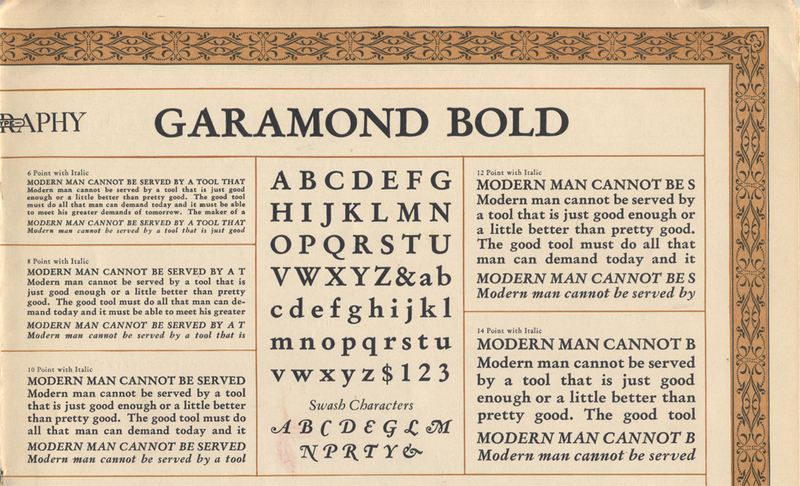 XI) for September 1927 which includes “A Showing of the Linotype Garamond Series.” It has a showing of Garamond [no. 1], Garamond Bold [no. 1]—both equipped with several swash capitals—and a set of supplemental border designs by T.M. Cleland (pp. 174–176). There is no accompanying text. Although the identity of the designer of the swash capitals is not revealed, I suspect it was Cleland since he is credited with having done a set for ATF Garamond years earlier. Detail of Linotype Garamond Bold from The Linotype Magazine (September 1927). Note the swash caps. 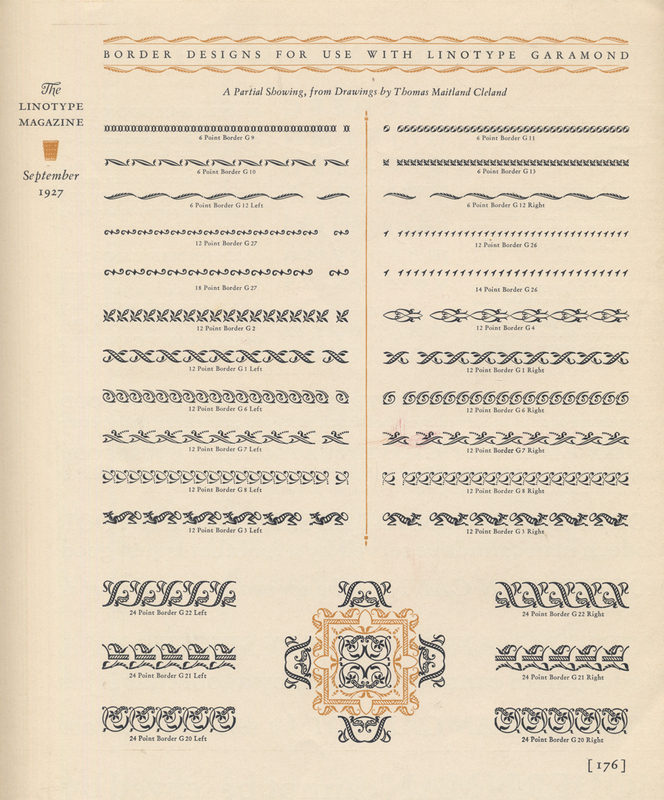 Border Designs for use with Linotype Garamond by T.M. Cleland. 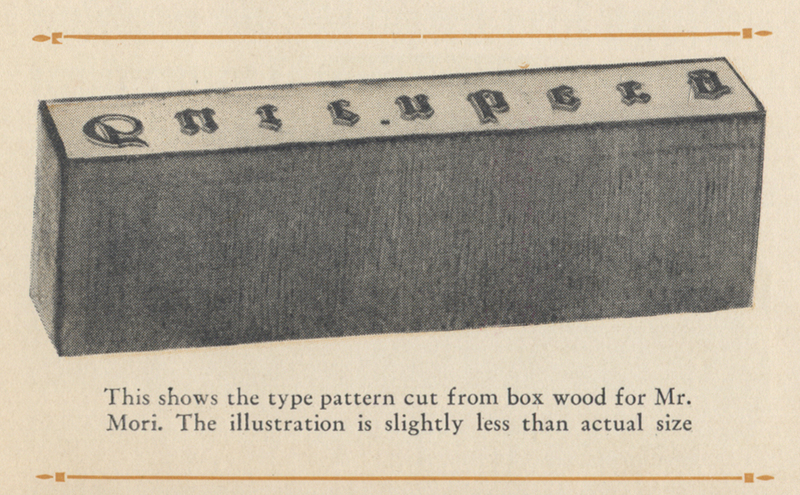 From The Linotype Magazine (September 1927 (cropped)). Although it makes no mention of Cleland’s border designs, it can be presumed that their announcement was the impetus for the short, tortuously written article by George W. Jones praising fleurons (p. 184). The article concludes with the declaration that “There is nothing tiresome in the nice use of these reproduced old flowers, either in mass, or in combination with initial and type; they never stand apart as something foreign and different, because they always appear to be, as they are, part of the design.” Linotype’s support of traditional bookish typography is further afﬁrmed elsewhere in the magazine. Whatever else their embittered enemies may charge against the Continent’s neo-artists, nobody can charge them with standing still. Indeed, they move so swiftly that it is slightly embarrassing for their own enthusiastic historians, who too often ﬁnd themselves explaining as brand-new a phase of neo-art that its inventors have already abandoned. So just now, while the vorticinists and the objectivists are describing their art as the ﬁnal modernism and sneering at yesterday’s cubists as traditionalists, they themselves are being discarded by the ultra-modernistic World-Stylists, who at the moment are the great white hope of all super-Advancists and Liberationists. World-Style, as the meanest intelligence can, or at least should, perceive, is an art that speaks the same speech to every one everywhere. Sour critics complain that, so far, this new world-speech seems even less lucid than the present babel of tongues. The most determined critic admits freely that its shape is simple enough. It consists entirely of cubes, squares and triangles with now and then a circle. Obviously, a Hottentot can recognize these shapes as readily can a member of the Smithsonian Institution. The only difﬁculty is to know in any speciﬁc case what they are supposed to mean. Unhappily, the World-Stylists have such disdain (no doubt rightly) for our humble common speech that their verbal manner is as esoteric as their graphic symbolism. Hence their rather haughty attempts to explain their purposes do little if anything to dissipate the medieval ignorance in which conventional folk dwell. It is to be feared that to them the new World-Style may seem nothing but Cubism, whereas to the World-Stylist, the Cubist is as antiquated as a Sumerian inscription. Cubism played unworthy tricks with its cubes and prisms, superimposing and mixing them in the worst traditions of picturesqueness. The World-Stylist despises such pandering to prettiness. His ideal is to eliminate the last vestige of sophistication from the geometric form, making it stand as stark line without “artistic” grouping or other false aesthetic nonsense. The slogans of the World-Stylists are “Back to simplicity” and “Back to the elemental.” Obviously, the ideal simplicity would be Nothing. As a matter of fact, certain dark sayings of certain neo-artists indicate that they cogitate darkly on this as the ultimate dark idea. At present, however, the most impassioned buyer of neo-art is deplorably below that high plane of thought which would make him willing to pay for nothing. Therefore, even the advanced workers feel constrained to bow to philistine conventionality so far as to produce a design that is at least visible. Beyond that they will not descend. Their geometric triangles, squares, and circles not only fulﬁll their stern rule of “form without ornament,” but also are grandly devoid of that other long-standing superstition of conventional art—interest. The true leaders among the World-Stylists see the world of tomorrow as a world of “Man free from Art”—a term which their opponents have seized joyously, altering it by a slight mis-translation to the nihilistic “Man without Art.” It is true that the neo-mentalism and the neo-linguism of the neo-artists make it an Einsteinian exercise to ﬁnd out what they do mean, but to be fair to them, we must declare that they don’t mean that. They want to free mankind from slavery to art as we pitiable conventionalists conceive it. They know that what we consider beautiful, and that what always has been considered beautiful, is in truth ugly. What we consider is ugly, they, on the other hand, know to be beautiful. At this time, the movement’s truly vigorous leaders are the artists of the Central-Euopean group, and they are doing their most perfect work in the advertising ﬁeld. In some particularly laudable designs, the square and triangle have been so successfully mobilized that both the conventional typographer and the conventional artist can discover only by agonizing study which of the geometrical masses are supposed to be type and which are supposed to be illustration. So completely successful is this supreme form of the new world-speech that the common lay reader can decipher no part of it. This is immaterial. The great thing is that he has been arrested; and the slight difﬁculty that he does not know why he is arrested, or by what, clearly is only a minor philistine objection. Most of their Latin and Germanic colleagues still are behind this point. They, to tell the horrid truth, still are in the fetters of the old slavery to some extent. They cannot, as yet, liberate themselves from a surviving feeble recollection of such absurdities as perspective ands similar antiquated superstitions. They remain stupidly servile, too often, to the stupid belief that s page has top, bottom and sides. Some of them go so far as to retain the delusion that the words of one sentence should march approximately together. But the best of them have conquered these primitive inhibitions. One recently “spattered” his space with completely isolated words free of all relationships. His only failure (a noble one, it must be admitted) was that the words were in a type which could, with some effort, be read. In this point, of course, his achievement fell short of the ﬁnest ideal of these enthusiastic geometricists. A far better advertisement has just appeared and is earning the almost unanimous approval of all neo-artists. In this, the principal word (the only one that would tell what the advertisement is about) i a practically perfect neo-typography of triangles, rectangles and quadratures, wholly devoid of paltry likeness to any letter design in any language. The neo-word dangles vertically from a group of squares which, with the slight addition of the advertiser’s name, complete the stirring appeal. As the name of the advertising ﬁrm happens to be one which gives no hint as to its business or product, it is obvious that this piece of publicity is justly considered to be a triumph for World-Style. Whatever our less advanced practitioners may think of the advertiser, all must admit that he deserves international respect as a foremost optimist who has carried faith in newspaper space to the ultimate point. One cannot but feel that modernistic though he is, he must believe in fairies. The Linotype Magazine for September 1927 also contains a short article on the ﬁftieth anniversary of the Typographische Gesellschaft of Leipzig and an illustrated summary by Harry L. Gage of Gustav Mori’s researches into Johannes Gutenberg’s type making methods (pp. 177–179). 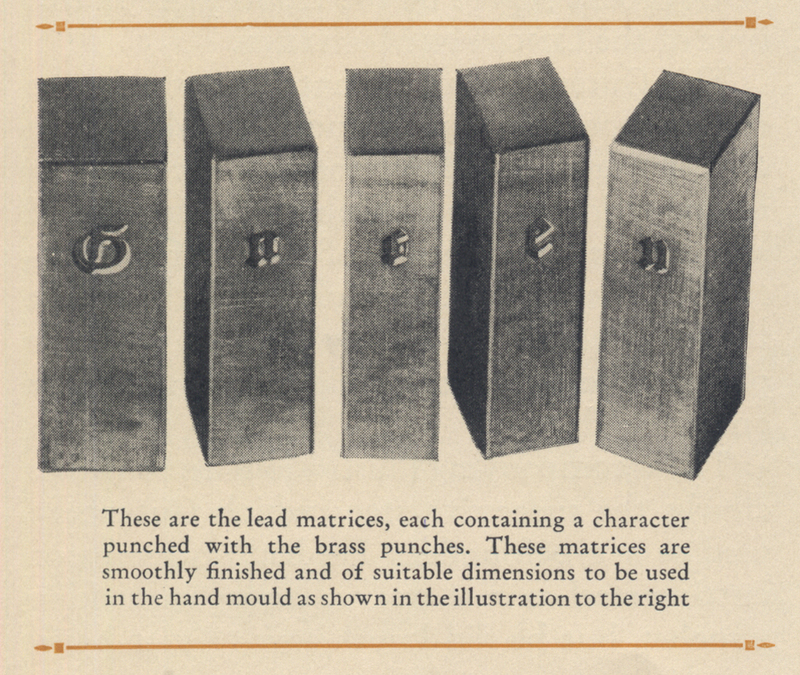 Mori’s theory is that Gutenberg cut patterns for his letters in wood which were then moulded into ﬁne sand which he ﬁlled with brass to make a rough casting. This was then cut into individual letters which were polished and then punched into lead matrices. Then the matrices were cast in a type mould. There is no explanation why Mori thought Gutenberg did not cut his punches in steel or use copper matrices as was done by later punch cutters. The illustrations imply that Gutenberg was cutting whole words in wood, though this is not stated. Whether Mori’s theory is right or not, his recreation of a portion of text from the Gutenberg Bible fails to adequately match the original. Type pattern cut from box wood. Rough casting made from a sand mould of the wood pattern. Tooled, polished and cut casting. Mould in open and closed positions. Left: setting by D. Stempel AG with types cast following Gustav Mori’s directions. 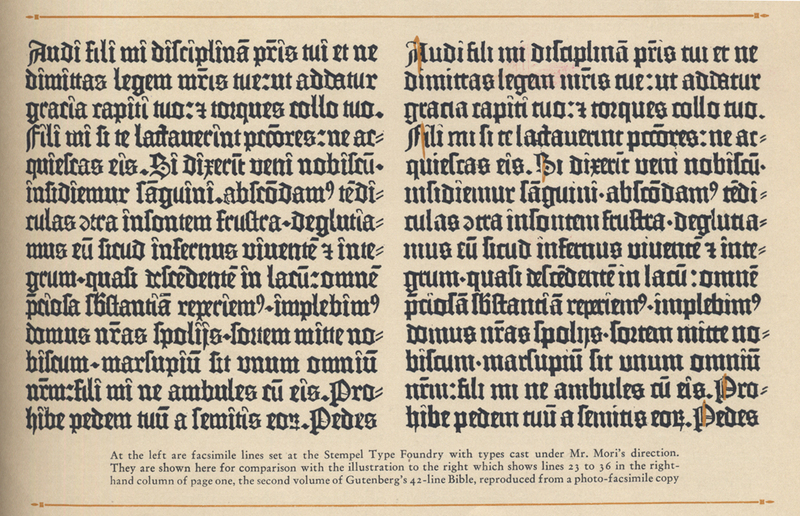 Right: facsimile page from the Gutenberg Bible. The cover design is signed CPH (most likely Clarence Pearson Hornung). *I am skeptical that the text was actually written by a European. It may be the work of Harry L. Gage given some of the references in the text.